Roofing repairs for any roof type. Anchor Roofing & Waterproofing has over 25 years experience in the roofing industry and we are able to offer all our clients exceptional pricing and workmanship on all Roof Repairs. We offer competitive pricing on all work carried out and operate in Cape Town as well as the Boland and Surrounds. Contact us today and speak to us about letting us help you with repairing your roof. Is your roof sagging? We offer roof re-alignment, roof support and roof corrections. Is your concrete roof leaking into your rooms below from the balconies above? 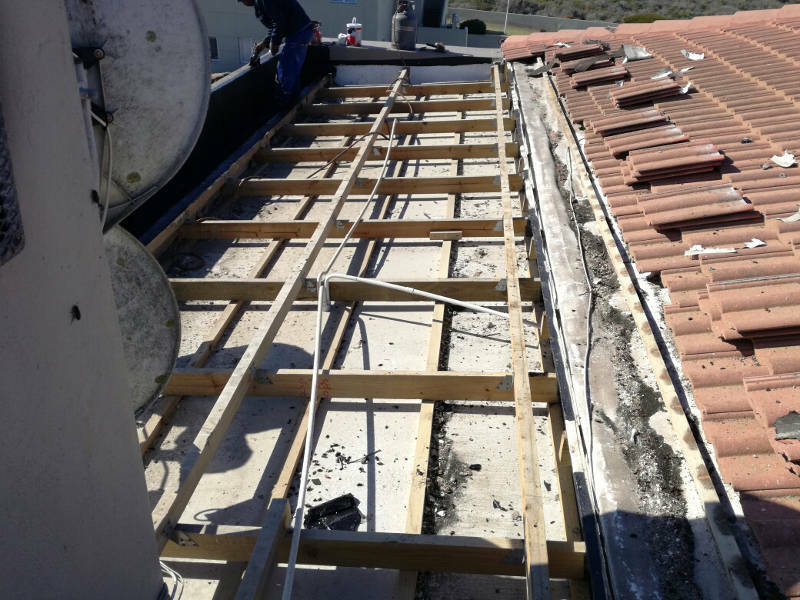 We specialise in waterproofing of concrete decks with a torch on heat fuse system and re-tiling the balcony areas thereafter. Is your house too hot or too cold in Summer or Winter? We insulate your roof area with isotherm to assist with the temperature management of your home or business. We replace cracked roof tiles or replace ridge cappings to prevent leaks, damp or to restore original the appearance of your roof. Are your box gutters sagging or leaking – contact us to re-align or replace your box gutters.